As well as being the place from which Australia is governed, Canberra is full of excellent museums, art galleries, exhibitions, and festivals. It is a new – and to some extent unusual – city, but one that is very much central to our national identity … and perhaps to your Big Lap adventure. Canberra was chosen as the site of a national capital back in 1908 as a way of defusing the simmering rivalry between New South Wales and Victoria. 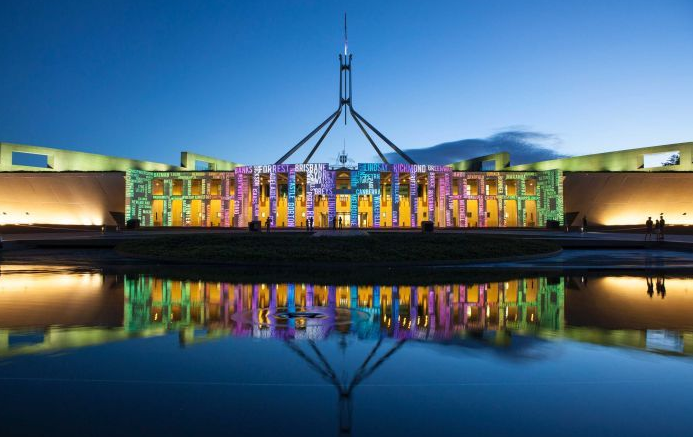 It was specifically designed to be the home of Federal Parliament and it is outstandingly neat and well ordered, although some people find it a little too sanitised. Nonetheless, Canberra is indisputably a beautiful city and it is packed with an extraordinary 12 million trees, as well as superb botanic gardens, and the magnificent Lake Burley Griffin. Indeed, architect Walter Burley Griffin always planned this to be a garden city … albeit for just 25,000 people. The city’s current population of around 350,000 is dwarfed by those of Melbourne and Sydney … but its status as national capital is reflected in the quality of the shows and exhibitions it plays host to. After a month or two out in the bush, many grey nomads relish the chance to sweep the dust out of the van, trade their thongs for polished shoes, and bust the budget and hit the capital’s theatres and restaurant. Many also choose to make their visit here coincide with Floriade, the world-class annual floral exhibition. The ‘Celebration of Spring’ stretches from mid-September to mid-October and famously dazzles visitors with more than a million blooms. There is more to the capital than flowers and light entertainment, however. This is a place to learn how our democracy operates and to discover how its history was forged. Most visitors choose to have a tour of Parliament House, and to look at the High Court building. You can also spend countless hours at the truly memorable Australian War Memorial, as well as the National Gallery and the National Museum. Canberra is situated in the Australian Capital Territory, which is a mere 88 kilometres long and 30 kilometres wide … but is packed with natural and cultural wonders. The city is a wonderful base from which to explore the magnificence of the surrounding region. Away from the city streets of Canberra, the ACT’s Namadgi National Park, Tidbinbilla Nature Reserve, and Uriarra State Forest virtually back onto the New South Wales high country. There’s great camping, bush walking and fishing to be had right on the doorstep of the capital. It’s certainly also worth a short drive out to the ACT’s wine region. There are more than 140 vineyards in the immediate vicinity and they provide grey nomads another welcome opportunity to visit to cellar doors and to sample the produce. Wake up and smell the roses at the spectacular Floriade festival; spend an absorbing day at the Australian War Memorial; see where our fate is decided by visiting Parliament House; enjoy some of the best of Australian art at the National Gallery; have a picnic on the shores of Lake Burley Griffin. There is an enormous range of wonderful caravan parks and camping options in the Canberra region. As the national capital it forms a vital part of many holidaymakers’ – not just grey nomads’ – trips and caters to all needs. Beyond the city limits, there are also plenty of more natural options. Car-based camping is only permitted at the three designated campgrounds in Namadgi National Park – Honeysuckle, Orroral and Mt Clear campground and bookings are essential. Honeysuckle is the most developed and Mt Clear is the most remote campsite with basic facilities and access via an unsealed road. There are a number of campsites in the Uriarra State Forest and, of course, the massive alpine national parks of New South Wales are not far away either. If you are looking for a place to stay, let AirRentalz guide you to some great accommodation.